Mr. Media is recorded live before a studio audience of gypsies, techies, tramps and geeks, who have next to nothing in common but a growing interest in each others’ well-being… in the NEW new media capital of the world… St. Petersburg, Florida! Geeks are generally unhealthy people, just like you and me. Okay, like you, anyway; the wife and I literally joined the local Y yesterday to get back to the gym and take a stand against the rapid onset of middle age. But enough about me. Let’s get back to the geeks and freaks in the audience. Your color is poor. So is your circulation. You’re fat and slovenly, too. Seriously, wipe that drool off your chin; it’s grossing me out. 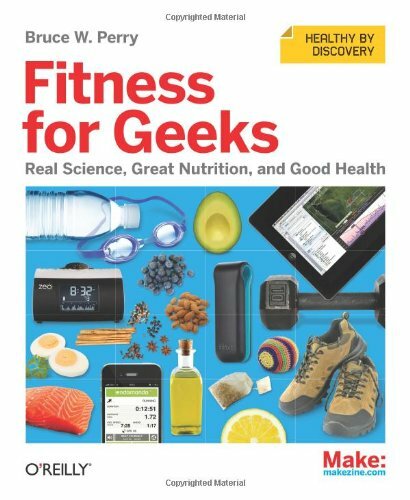 You can LISTEN to this interview with writer BRUCE W. PERRY, author of FITNESS FOR GEEKS, by clicking the audio player above! Never getting up from your computer terminals and working for hours on end in dimly lit rooms, never experiencing sunlight, will do that to a fella. Another problem: you’re too smart for your own good. You think you know everything about everything because you’ve got the knowledge of the Internet forever at your fingertips. But while you could run C+++ circles around the rest of us mere mortals, you’re doing a crappy job of maintaining your health. You’re only going to be 23 and know everything for so long. Then you’re going to turn into one of us – you know, your parents. It’s not too late to do something about the situation, and software engineer Bruce W. Perry has written the perfect life hack for you: Fitness for Geeks: Real Science, Great Nutrition, and Good Health. It’s even produced by the ultimate geek publisher, O’Reilly.